It all started in Maui, Hawaii, where Yong-guk, was on his honeymoon. As he gazed up at the starry night sky from the observatories, he tried his best to capture the breathtaking view with his professional grade digital camera. But his high-spec device couldn’t do anything beyond what all traditional cameras can do, which was to capture the view that lies in front of the camera lens. As an avid blogger and photographer, he had always desired a camera that could capture an awesome view in its entirety. The FITT360 is a completely new product for the camera market – a wearable camera device, in the form of a neck band, that takes 360-degree footage. Mass production of the FITT360 has already started, and it has been winning global recognition, for example being selected as a CES 2018 Innovation Award Honoree in the Digital Imaging & Photography category. The FITT360 also gathered eight times more funding than the team’s initial goal of $50,000 on Kickstarter. While fate has led Linkflow to first focus on B2B – namely, the security industry – it continues to seek further opportunity in the customer end. FITT360 has potential applications as a personal security device. It can be used to record extreme sports. But above of all, the team holds high hopes on the growing need from content creators such as YouTubers. “The product is ideal. You can simply swing it around your neck while you pursue outdoor activities and hobbies, even when paragliding or surfing. The fact is that these contents exist today, but YouTubers and bloggers are burdened with bulky filming equipment,” the CEO explained. With the enthusiasm that FITT360 SECURITY has received in the B2B world and Linkflow’s ongoing pursuits in the consumer sector, it’s clear that the spin-off and the team have come a long way. However, as a growing venture, the team recounts the trials they’ve overcome together to stay passionate and ambitious. “It wasn’t all just rainbows and butterflies,” says Kim as he describes the countless disappointments he encountered in the search for Linkflow’s first partnerships. FITT360 actually started out as a head band the sat on the ears, but was eventually modified to a neck band as a result of such trial-and-error. Part of the reason was for functionality – good height and stability. Sitting on the neck, the cameras can capture the surroundings from an optimal view – very close to eye-level. It is also less susceptible to motion and vibration as the neck and shoulders move much less than the head. Another part was to prevent it from offending other people. 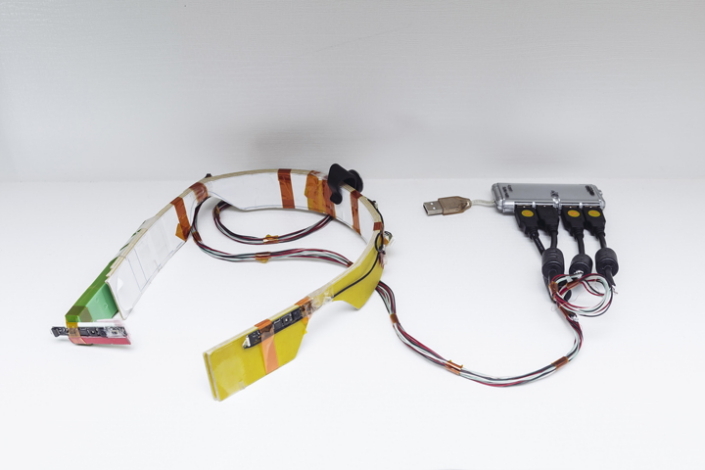 A device that resembles the form of a pair of glasses or an earphone could seem like a surveillance device and people could get the impression that they are being watched – they don’t like that at all. Linkflow believes that this kind of flexibility will help them continue to grow. Many start-up businesses decide that survival is enough and seek to maintain status quo once they see a stable business. “Instead, you have to push further,” says Yong-guk. “Samsung’s C-Lab initiative encourages you to keep digging for new ideas and that, I think, is what got us to where we are.” And that is what Linkflow plans to continue to do. 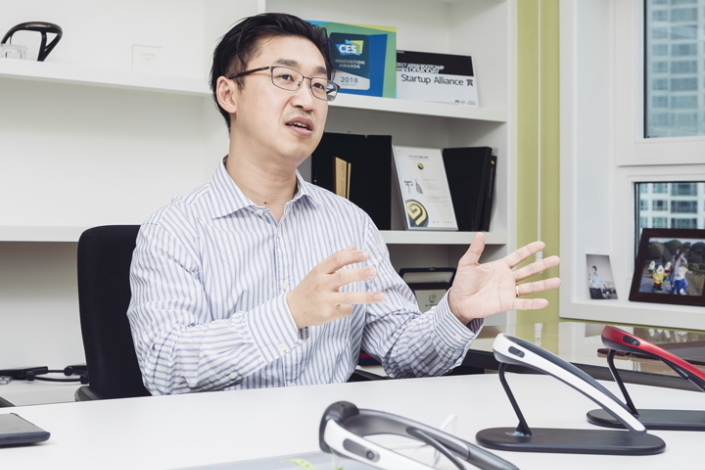 “Competitors can copy the shell of our product but they don’t know how and why we changed each nook and cranny of FITT360 – and details matter,” stresses Yong-guk. “Coming from Samsung, we plan to adopt the same rapid-development strategy you can see in Samsung’s products. We start preparing the next-generation model right after mass production hits, so that by the time your competitors offer something similar, we’re already unveiling the upgraded version and providing the previous one at a better price.” Linkflow believes that better technologies and new ideas will continue to give them the edge and that will help catapult them to the top of the industry.